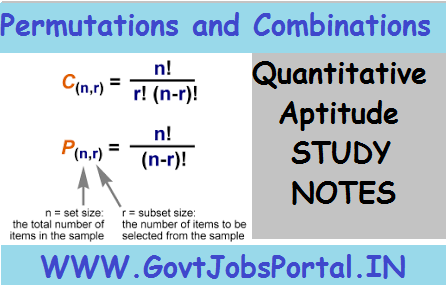 You know that quantitative aptitude section is most important in bank exams in PO and Clerk and for other competitive exams because if you want good score in bank exam then you have to score good in maths. In competitive exams the most important thing is time management, if you know how to manage your time then you can do well in Bank Exams as well as in other competitive exams. That’s where maths shortcut tricks and formula are comes into action. So continuously we are providing shortcut tricks on different maths topics. Today’s topic is Permutations and combinations. This is the one of the most important topic in quantitative aptitude section in bank and SSC exam. You should know how to Permutations and combinations questions and answers in very short time for bank exam. From this chapter around 1-2 questions are given in the SBI and IBPS exams. For this here we are providing shortcut tricks and quicker method to solve permutations and combinations problems in very short time. In first we will look at some important points, which are most important for permutations and combinations and also for probability. The product of n consecutive positive integers beginning with 1 is denoted by n! Is read as factorial n or 5! is read as factorial five, etc. So , by this method we can find out factorial of any number. Each of the different arrangements which can be made by taking some or all of the given things or objects at time is called a permutation. The symbol npr denotes the no. of permutations of n different things taken r at a time. The letter P stands for permutation. total no. of words ( with or without meaning) that can be formed form n distinct letter word is given by npn = n! Total no. of words (meaning or without meaning) formed from a word ANIL taking all at a time is given by 4p4 = 4! Total no. of words (meaning or without meaning) formed a given word of n letters in which particular letters are repeated in m, k times is given by = n! / m!k! 7!/2!2! as in KANCHAN total no. of letter are 7 in which A & N is repeated two times each. nCr = n! / r! (n – r)! no. of ways of arranging n peoples in circular track = (n-1)! Ex. 1: If nP3 = 210, find n.
Solution: 75! / (75 – 2)! Ex. 3: if nC2 = nC5 find n.
Solution: n! / 2! (n – 2)! = n! / 5! (n – 5)! Or, 5! (n – 5)! = 2! (n – 2)! Or, 5 * 4 * 3 * 2 * (n – 5)! = 2 * (n – 2) * (n – 3) * (n – 4) * (n – 5)! Ex. 4: how many quadrilaterals can be formed by joining the vertices of an octagon? Solution: A quadrilateral can be formed by joining the vertices of an octagon? Solution: A quadrilateral has 4 sides or 4 vertices whereas an octagon has 8 sides or vertices. Reqd no. of quadrilateral = 8C4 = 8! / 4! (8 – 4)! Ex. 5: with specific rule: Suppose there are 42 men and 16 women in a party. Each man shakes his hand only with all the men and each woman shakes her hand only with all the women. We have to find the maximum no. of handshakes that have taken place at the party. Solution: from each group of two persons we have one handshake. = 42! / 2! 40! = 42 * 41 * 40! / 2 * 1 * 40! = 16C2 = 16! / 2! (16 – 2)! Maximum no. of handshakes = 861 + 120 = 981.